Railpictures.ca - Stephen C. Host Photo: Georgetown was one of my favourite towns as a child, and I have family history here. Not surprising my favourite childhood towns involved some form of railways: Georgetown, Brampton, and Streetsville :) Built in 1858 by the Grand Trunk, this handsome stone structure is used for both GO and VIA services, with space inside for a GO agent. But the station seems to lack air conditioning and is inhospitable in the morning owing to a greenhouse effect, but at least it’s still open for easy washroom access. A small group of us used to go here frequently in the early 2000′s (Matt Watson, Brian Switzer, Shane Murphy, Marcus Stevens amongst others) and now a new group seems to frequent the station, it’s a nice quiet place to watch trains. This is a detour train, called 373 and it was an otherwise calm windless, but hot morning until this train entirely of centrebeams passed at track speed. I’d certainly say this train made an efficient fan, kicking winds upwards of 50 MPH, threatening to blow over someone’s tripod setup. In the lead was a CN GEVO, with 70 or so empty centrebeams , the DPU as you see here, and 60+ more empty centrebeams, the “fan train” as I dub it did a good job keeping us cool as it passed by, during this unusually hot and sunny Ontario summer. Thank god it cooled off this weekend, instead of gallivanting about this weekend for more photos in the rain, I’m taking a nice break and catching up on posting some pictures amongst other chores :) Cheers all. | Railpictures.ca – Canadian Railway Photography – photographie ferroviaire Canadienne. Caption: Georgetown was one of my favourite towns as a child, and I have family history here. 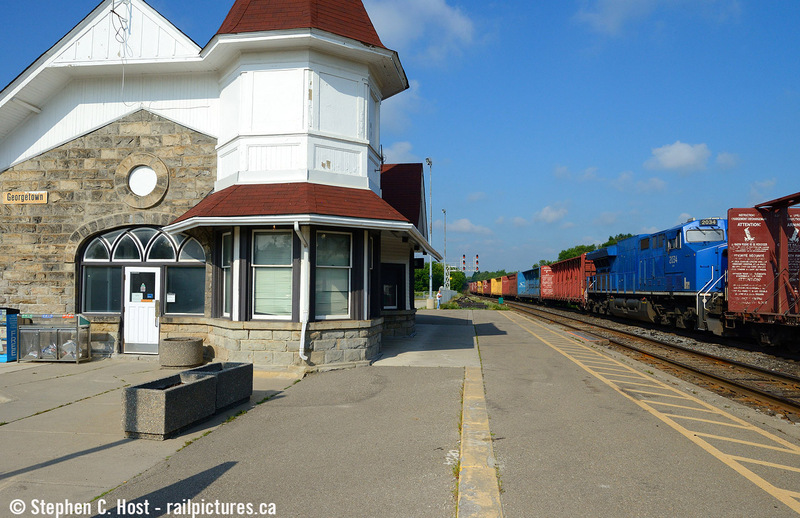 Not surprising my favourite childhood towns involved some form of railways: Georgetown, Brampton, and Streetsville :) Built in 1855-1856 by the Grand Trunk, this handsome stone structure is used for both GO and VIA services, with space inside for a GO agent. But the station seems to lack air conditioning and is inhospitable in the morning owing to a greenhouse effect, but at least it's still open for easy washroom access. A small group of us used to go here frequently in the early 2000's (Matt Watson, Brian Switzer, Shane Murphy, Marcus Stevens, RTCDave amongst others) and now a new group seems to frequent the station, it's a nice quiet place to watch trains. This is a detour train, called 373 and it was an otherwise calm windless, but hot morning until this train entirely of centrebeams passed at track speed. I'd certainly say this train made an efficient fan, kicking winds upwards of 50 MPH, threatening to blow over someone's tripod setup. In the lead was a CN GEVO, with 70 or so empty centrebeams , the DPU as you see here, and 60+ more empty centrebeams, the "fan train" as I dub it did a good job keeping us cool as it passed by, during this unusually hot and sunny Ontario summer. Thank god it cooled off this weekend, instead of gallivanting about this weekend for more photos in the rain, I'm taking a nice break and catching up on posting some pictures amongst other chores :) Cheers all. I can see the problem now, if there were holes on the sides some lumber may be small enough to fall through the ends due forces to aft or fore of the car. One has to design a mesh strong enough to contain product and porous enough to allow air flow through to minimize wind resistance and not allow product to fall through. And i can see a design akin to a chain link fence but much much thicker or a second design using multiple air intake holes like the type you see on some muscle cars, which may allow air to flow through and protect against product ingress. Phil, I agree, in fact, if you had solid centres on a Centre beam you’d subject the train to problems with winds on the perpendicular, a heavy wind would derail a train not too dissimilar to an intermodal train during high winds. A sail – a great way to put it. Centre beams resistance is created by the ends of the cars not the centre portion as common sense would dictate. The old bulkhead flactars that use to carry lumber products were notorious for moving like a ships sails and on many an occasion ended up out the south end of the hump at Mac Yard despite the tracks having “retarders” at the south end. All because of the wind. FYI DP power are placed on trains for better train handling and to counter act the “buff and draft” forces. Not because of the weight of the train. Based on Matt’s observations I now understand why there’s a DPU on that train. Curious, is the design of a Centrebeam flatcar flawed then? What if the ends of the car had holes opened for airflow? Is the gain in product (inches, per side) compared to using boxcars Boxcars worth that much to essentially have all that wind resistance when empty? Interesting a DPU in the middle of a train full of centre beams. Yes Stephen, i’m sure a condo will go up on my folks property in Clarkson of 56 Years!! Sad innit? Don’t forget Dave P ! There’s a similar train out here called 347. It’s often 12,000ft of empty centerbeams. I remember getting called for it out of Watrous, looking at the tonnage profile, and thinking, “nice, we’re going to fly”. I was very much mistaken, It’s amazing how much resistance those empty centerbeams create. I should also note that Georgetown no longer seems immune to the development and intensification our provincial urban planners desire, there appear to be new condos about to go up along Main St near the station. Georgetown still has that small town feel but once the condos go up it’ll certainly change things!